This is a special type of Buddhist art which is based on religion. The Monasteries of Lahaul and Spiti, Pangi valley. Kinnaur and other areas of Himachal Pradesh have an amazing collection of religious manuscript, scriptures and paintings known as ” Thankas”. “Thankas” is the name given to the paintings on cloth and are believed to ward off the “evil eye” maleficent influences and prevent diseases and mental depression. were used by minstrels to illustrate the episode they were describing. These paintings are regular feature of any monastery and are found in abundance in the monasteries of Himachal Pradesh. Thankas http://www.sangye.it/cpg1418/displayimage.php?album=22&pos=0 are traditionally scroll paintings drawn on cloth with wonderful compositions of geometrical arrangements known as “Mandalas” and are steeped in oriental tradition. “Mandalas” are cosmic symbols whose strict geometrical structures display the order of cosmos. These Buddhist religious “Thankas” generally depict “Jataka” tales http://www.sangye.it/cpg1418/displayimage.php?album=22&pos=1 which recount the past lives of Lord Buddha http://www.sangye.it/cpg1418/displayimage.php?album=22&pos=2 . The Jataka Tales is of 100 stories and all the 100 stories depict the life of Lord Buddha http://www.sangye.it/cpg1418/displayimage.php?album=22&pos=3. In these paintings Buddha, “Bodhisattvas” and other divinities and portrayed with the impressive retinues or acolytes http://www.sangye.it/cpg1418/displayimage.php?album=22&pos=4 . In other representations these deities dominate the compositions and are shown as choir in their own paradise http://www.sangye.it/cpg1418/displayimage.php?album=22&pos=4. 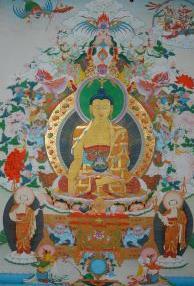 The essential schemes of these paradise also defined by the literature dedicated to them http://www.sangye.it/cpg1418/displayimage.php?album=22&pos=5 . For doing these paintings craftsmen were trained as apprentices in monasteries were they worked mainly by copying well known images of the scenes and the deities http://www.sangye.it/cpg1418/displayimage.php?album=22&pos=8 . The materials used for painting a “Thanka” is usually coarse woollen cotton, silk however, is preferred for important subjects. The process of doing these paintings is quite lengthy and time consuming. The fabric for painting is stretched on the wooden frame and coat of thin starchy paste made of animal glue and talcum powder is spread over the surface to fill in to the texture and block up the holes. As the paste dries, the artists rub the cloth with the flat stone to smoothen the surface. The outline of the figure and the subject to be represented are sketched on charcoal on the surface. The drawing always begins with the central figure which represents the focal point of composition http://www.sangye.it/cpg1418/displayimage.php?album=22&pos=7 . After this various colours are applied over these drawings with the brush. The main colour used is the Gold colour which is widely used for representing garments or the emblems of the deities represented. An impressive feature of these paintings is the unique colour scheme. Unique stone colours are white, red, pink, dark red, blue, sky blue, dark blue, green and light green, colours. Even the Buddha’s and the Bodhisattvas and the other divinities have a particular colour of their own. Pure gold is used in the body of Buddha and Bodhisattva, whereas the other deities are represented by their own particular colours. While a combative and terrifying aspect is depicted by red or dark blue colour http://www.sangye.it/cpg1418/displayimage.php?album=22&pos=6 . Paintings are mounted on the walls of the monasteries in accordance with certain Buddhist rules. The course takes a long period of hard work, concentration, compassion and imagination. ln the first period, to start with, Practice is done to make the head, the body and clothes of Lord Buddha Shakyamuni. This is done on a wooden board with the use of a bamboo pencil, black ink and white powder, with the accurate measurements and scales. In the second period, again the head, body and clothes ot`Green Tara is practised with the same things given above. ln the third period, practice to draw the head, body and clothes of bajara pani is done. In the fourth period, again the head, body and clothes of Chakrasambhara is practised, which is wrathful deity. Fires are also drawn around the deity, as it shows the symbol of protection of religion. Till now, everything is practised on the wooden board. Now, practice is done on paper and canvas with charcoal and pencil. Here, we also learn to make ‘canvas’ on which painting is done, with a fine cloth. Then we start Thanka painting. ln the fifth period, sketches of deities, background and landscapes related to these deities are practised on the canvas, with accurate measurements. ln the sixth period, colour paintings and brushes are made into use. How the different colours are mixed to make new colours. Some unique colours are red, pink, and blue. Pure gold and silver is used on the body of the Buddha and deities and their crowns. The background is painted according to the literature. In the seventh period,·shading is practised on the deities, flowers like rose, lotus, sky, earth, clouds, trees, grasses, stones etc. In the last and final period, final touch is given to the painting. When the canvas is ready, that is when painting and colouring is done it is then given a final touch. Now it is given a frame which is sewed by a white thread around it, then with a red silk cloth, then a yellow silk cloth and then a blue silk cloth, the silk is Traditional, all according to the size of the painting. At last bordered with a red thread. At the top and bottom of the painting wooden rods are attached to it to keep the painting safe. Now the whole thing is called a “Thanka”. The paintings should always be covered. For covering it a cloth of yellow and red colour are used. It should mainly be uncovered for worship. Then one can see the mysterious world of “Thanka” painting.